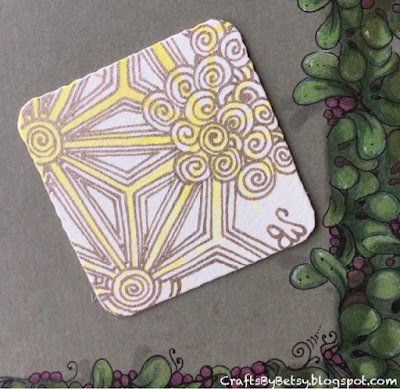 by Betsy: Just a little Bijou! And following up with a Bijou tile I made with my last post, here is my 9th day of the 30 day coloring challenge. It's tangled with a Gelly Roll Metallic Sepia #517. The tangles are Printemps, and a hybrid of Arukas and Phroz. Both Printemps and Arukas are original Zentangle® patterns, Phroz is by Lynn Mead.